Rotoderby is offering amazing prizes for the month of July! 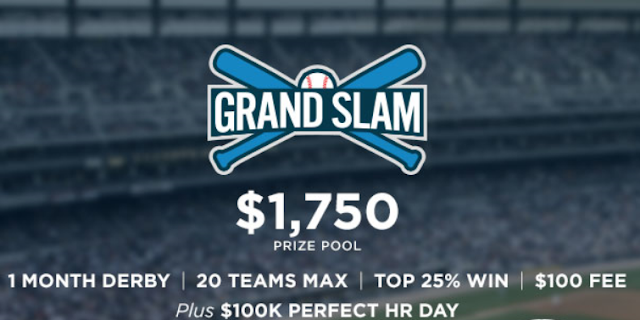 A $100 entry will get you into the $1,750, Grand Slam. Catch is, it's a 20 team pool and first come first serve! If you miss out on that action, there is a $300 winner take all Gold Derby for an entry fee of just $19. For a $9 entry fee, you can win $140. Choose 10 players from the player pool, 6 infielders and 4 outfielders. Do not exceed the "HR Stat Cap" limit of 210 Home Runs. Bryce Harper hit 10 home runs in 12 games and leads the league with 43 RBI, but his 23 K% has allowed Mark Teixeira and Nelson Cruz to keep pace with him at the top at the top of the Rotoderby leaderboard. Teixeira has 4 home runs and 8 RBI less than Harper, but half the strikeouts! Cruz and Harper lead the league with 18 home runs. Harper will cost you just 13 home runs, Teixiera will run you 22 homers and Cruz is the most expensive player at 40 HRs. These guys will cost you 20 home runs or less! Harper is one of 15 players that will cost you the minimum 12/13 HRs. He is also the best player in the MLB this season. He has to be the first player you select. Braun hit 8 home runs and picked up 27 RBI in May. He will only cost you 19 homers. Goldschmidt is a bargain in 2015 due to a season ending injury in 2014 that limited him to 19 home runs. Take advantage. He hit 2 more homers in May than April, but did strikeout a few times more and has yet to match his April RBI total. After hitting just 3 home runs in April, Arenado has hit 7 in May, driving in 18 runs. He has 12 RBI in the last 7 days! Reddick hit 5 homers and drove in 18 runs in May. An absolute monster and he hit 7 home runs driving in 21 in May, but a 31 K% barely makes him a top 20 player this season, not to mention he will cost you 37 homers. 0 home runs .224 BA in the month of May. Cano has been the 5th WORST player in Rotoderby in 2015. He also has yet to hit a HR in the month of May. At just 14 HRs he is still cheap, but there are 5 better options listed above. Kemp has been just a single point better than Cano and also has yet to hit a HR in May. After hitting .326 in April, Kemp hit .186 in May. He will cost 25 HRs. 51 strikeouts has made him the worst player in Rotoderby.